Where were you at 7 a.m. on October 3, 2017? 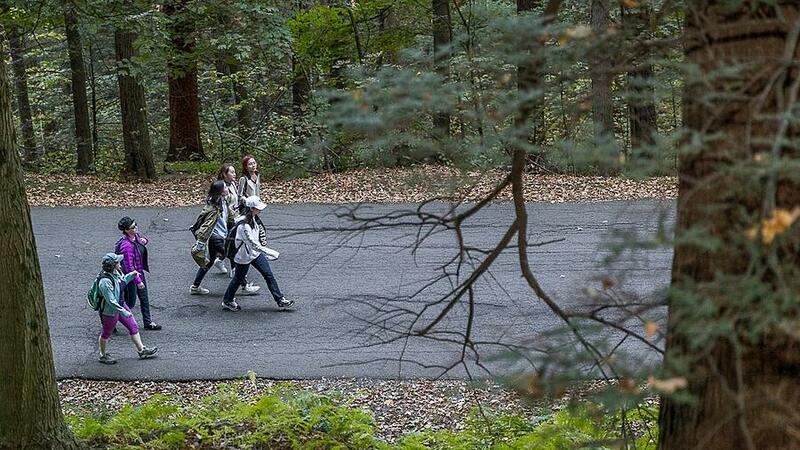 When the bell on Mary Lyon Hall rang in Mountain Day 2017, the campus was quiet and only one hiker was in Skinner State Park, home of Mount Holyoke. 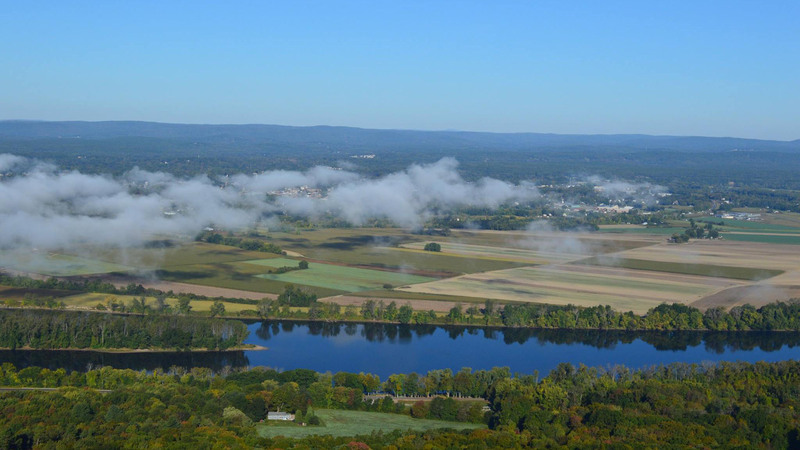 Mist covered the valley, hiding the Connecticut River winding below. The surprise news that the day had arrived bounced out like radar over the social media airwaves via the hashtag #MTNDayMHC. Within moments, it seemed, everyone everywhere knew. Early morning mist above the Connecticut River. Photo courtesy of Sam Tressy ’18. The first staff member on the summit was Latrina Denson, assistant dean of students, just before 8:30 a.m. “I have the permit!” she said. Moments later, Jonencia Wood, senior director of alumnae engagement in the Alumnae Association, arrived with boxes of temporary tattoos. 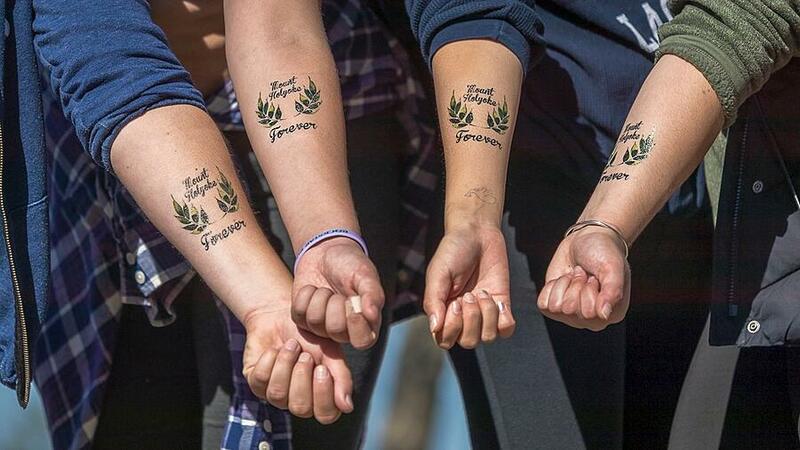 She was followed by Jennifer Grow ’94, the editor of the Alumnae Quarterly, and Danielle Lund, director of student and young alumnae engagement, with more materials, including spray bottles full of water to wet the tattoos. They also brought a map of the world with a dozen flags pinned to their respective countries. 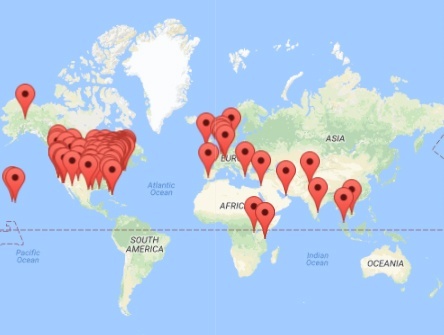 The flags marked the regions of the 163 alumnae reunions in honor of Mountain Day happening this day across the country and the world (19 countries!). 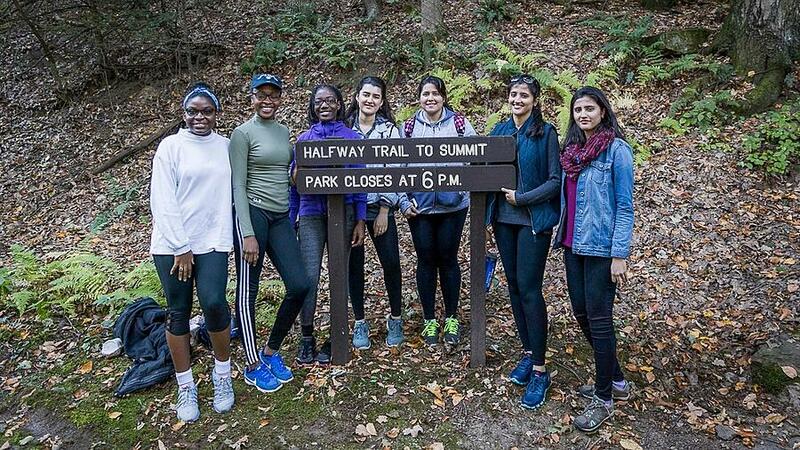 From Massachusetts to Malaysia, alums jumped into action after the bell was rung to hold their own Mountain Day celebrations in their own communities, complete with ice cream, hiking and friendship. The first hikers appeared at the top of the Halfway Trail near the south side of the Summit House just before 9 a.m., as the rising sun slowly burned off the mist below. Annie Choi, Lily Danieri and Ashley Cavanagh, all students in the class of 2019, even beat Dining Services’s ice cream delivery (fact: 1,500 Hoodsie Cups were served). That delivery coincided with the arrival of the first van loaded with students. Archives arrived a few minutes later with button-making materials — and Mountain Day 2017 was off! This was the third Mountain Day for both Elise Newcomer ’18 and Sarah McCool ’18. Both had hiked in their first and sophomore years at the College. Both had celebrated while they had been abroad during their junior year. Newcomer was in the College’s Montpellier program in France with six other students, and the program’s leader had led a surprise excursion on the big day. 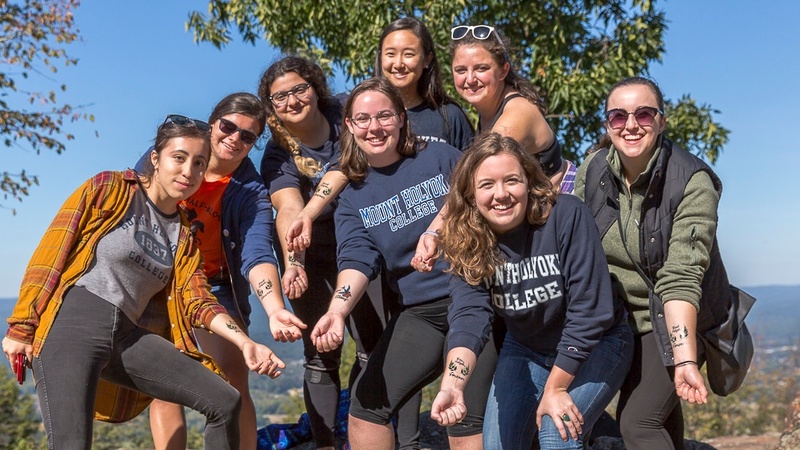 McCool spent Mountain Day 2016 at the Powerscourt Estate outside of Dublin, courtesy of three alumnae, who had gotten her name from the McCulloch Center for Global Initiatives, which in part oversees international education. They had picked her up, taken her to lunch and given her lots of advice about working and studying abroad. Maggie Murdock, Lillia Baird and Elaine Hartman, all class of 2018, have hiked all four years and gotten selfies with the president of the College. “A little bit!” said Murdock, to laughter. “It’s a nice change of pace,” Hartman said. “Nice to be part of the tradition,” said Johanna Brown, standing with her friends, Neorgia Grant and Toni-Ann Rankine, all the class of 2020. This was her and Grant’s second Mountain Day and Rankine’s first. “This year we’re taking you to the right spot!” Grant and Brown had told their friend this morning. Four staff members left at 8:40 a.m. running the 10.5 miles round trip from Mary Lyon Hall to the summit of Mount Holyoke and back: Polly Prewitt-Freilino (director of institutional research), the head of network, systems and application support, Joel Broyles, and the head of business intelligence, Devon Smith (both of LITS, Library, Information and Technology Services), and Liz Lierman, director of the CDC, Career Development Center. Their average pace, 9-minute miles, included the 1.75-mile ascent from the entrance of Skinner State Park to the summit. 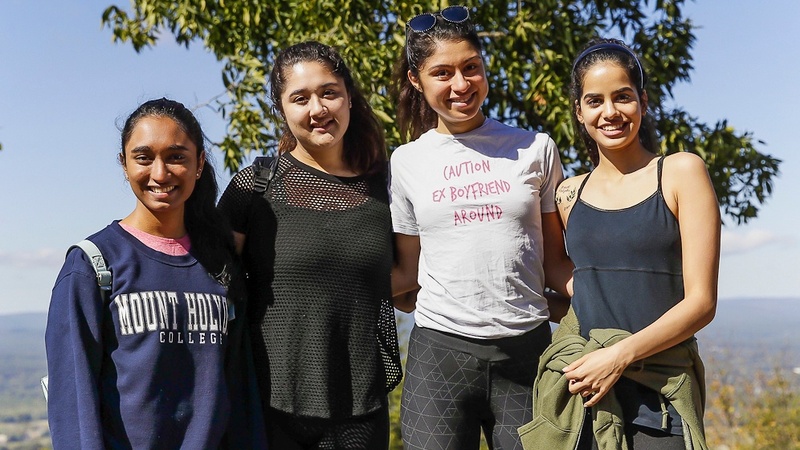 Athletic teams hiking together included cross country (the coach ran up), lacrosse, squash, field hockey and volleyball. Sisters who play field hockey together, Kaitlin Braz ’18 and Chelsea Braz ’21, hiked together, of course. “It’s very bonding for a team,” Kaitlin Braz said. 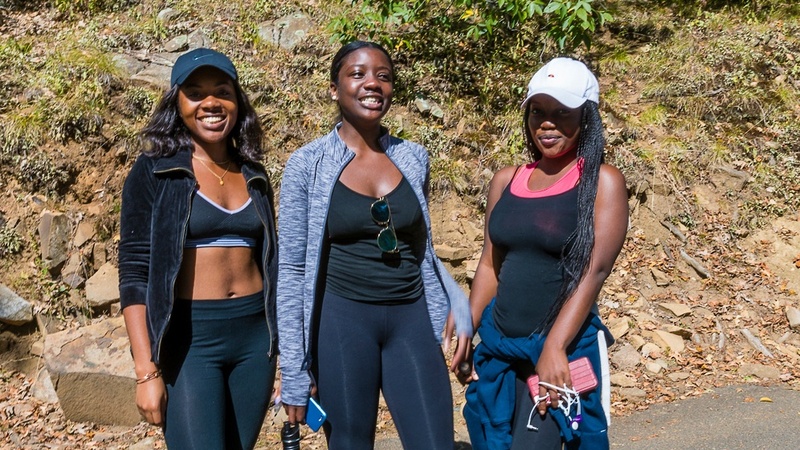 Lisa Burns FP’18 is a first-time hiker. She works at Mount Wachusett Community College in Gardner, Massachusetts, as a staff assistant in its TRIO program. A 10th-grade high school dropout, Burns was a student in the program before coming to what she called “THE finest college in the country” as a Frances Perkins Scholar, the College’s program for students over 25 who have experienced an interruption in their education. 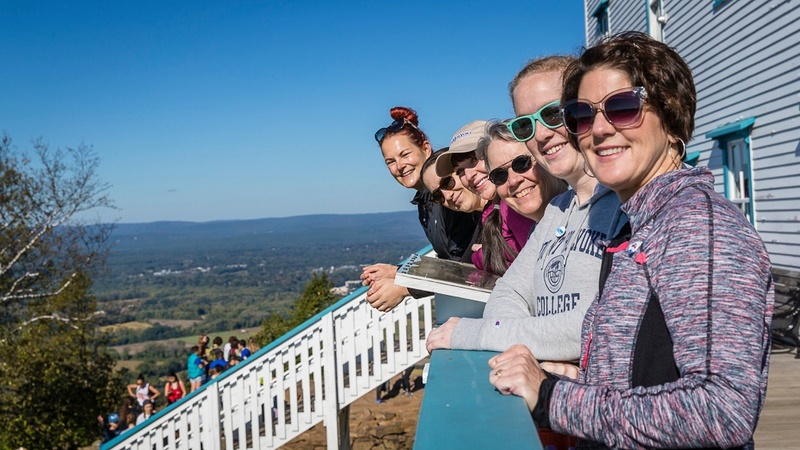 She was thrilled to hike up with what she called her “FP family,” which included several students who lived and worked in places like Bernardston, Massachusetts, and southern Vermont: more than an hour away, in other words. 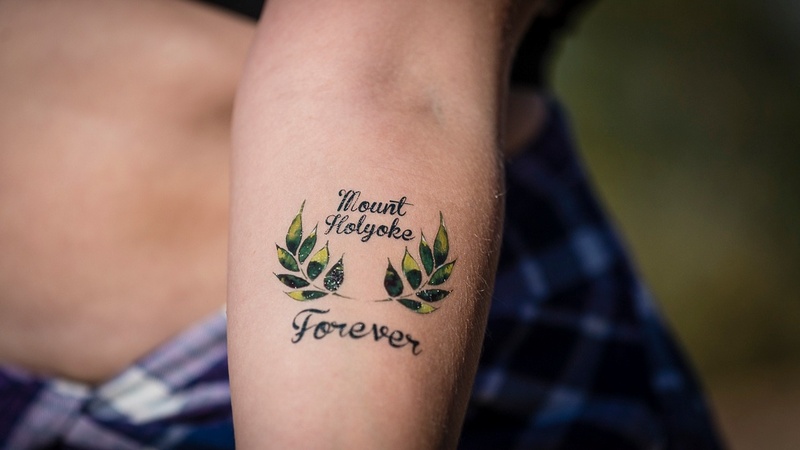 This year Mount Holyoke graduate students were specifically invited and encouraged to participate in Mountain Day. 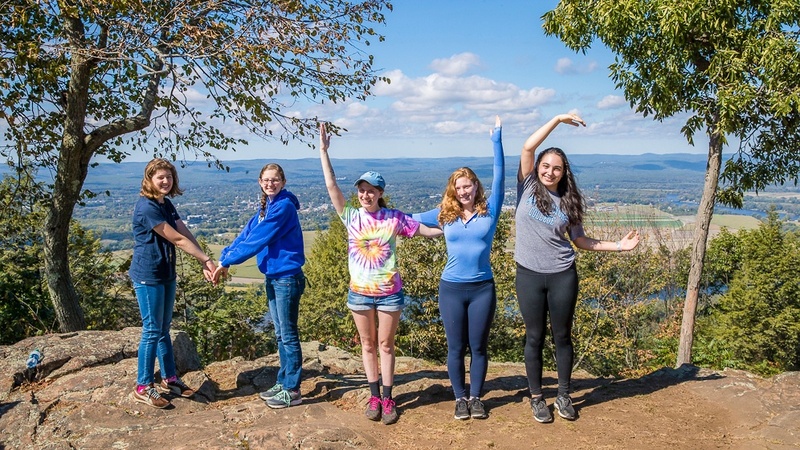 Sarah Tobias ’17, Anna Furr, Lauren Jones, Ethan Campbell and Jeffrey Cloak, all class of 2018 students in the College’s master of arts in teaching program, hiked together. 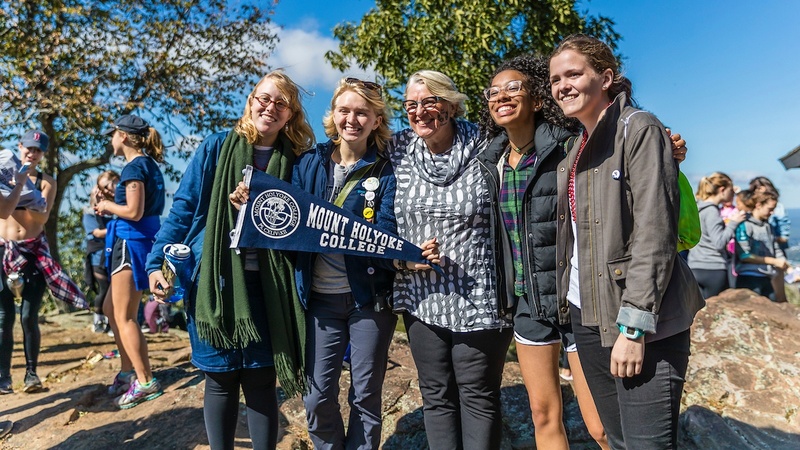 Among the faculty and staff spotted on the mountain: Ng Tian Hui, the orchestra director; Sandra Lawrence in psychology and education; Eva Paus, economics and director of the McCulloch Center for Global Initiatives; and Tricia Paik, the director of the Mount Holyoke College Art Museum on her first Mountain Day. Jordan Tirrell, math and statistics, hiked with his wife and their son, Colexender — they call him Ender — who had turned 3 months old the day before. “I like the ice cream, and the mountain and I love climbing and haven’t done it enough since this little guy,” Tirrell said, gesturing to the sleeping baby strapped to his chest. Mark Lauer in German studies hiked with his Five College colleagues from Smith, which was also hosting its Mountain Day. 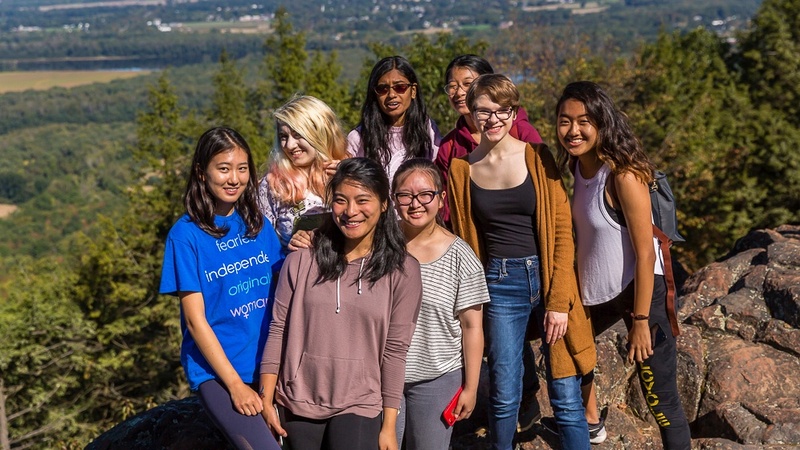 The friends considered both events and decided to participate in Mount Holyoke’s. 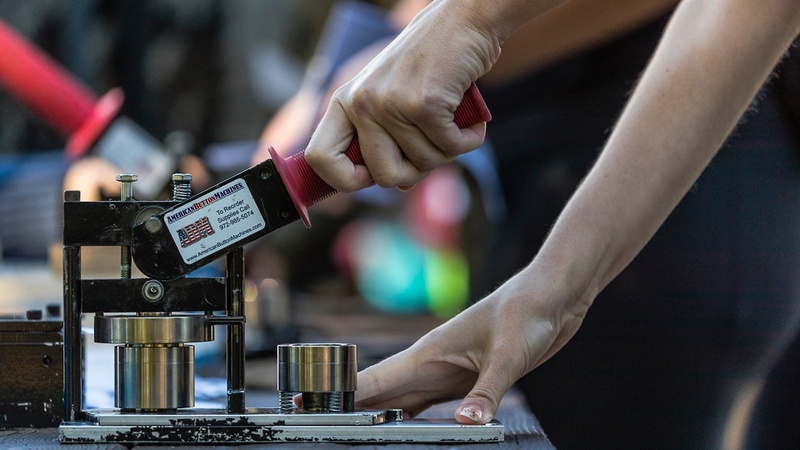 “More alumnae and more staff than I remember in the past,” said Leslie Fields, the head of Archives and Special Collections, who oversaw her office’s button-making activity all day. 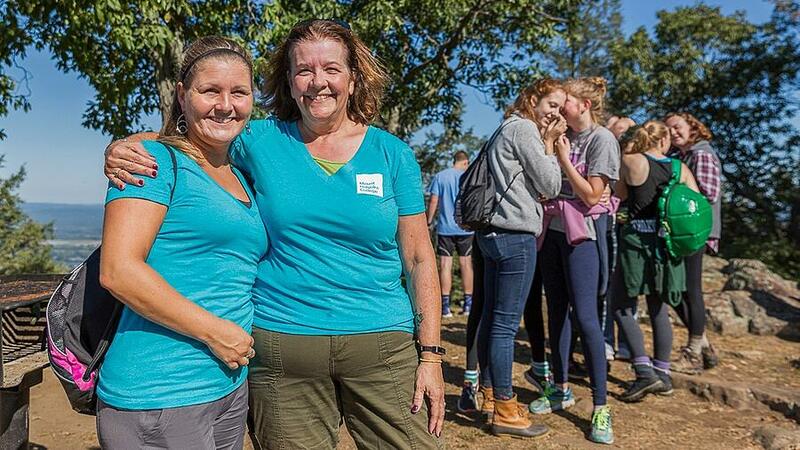 This year, staff members were specifically encouraged to make the trek, and many were decked out in their new Mount Holyoke staff T-shirts. two with archival images of the mountain from 1900 and 1914. 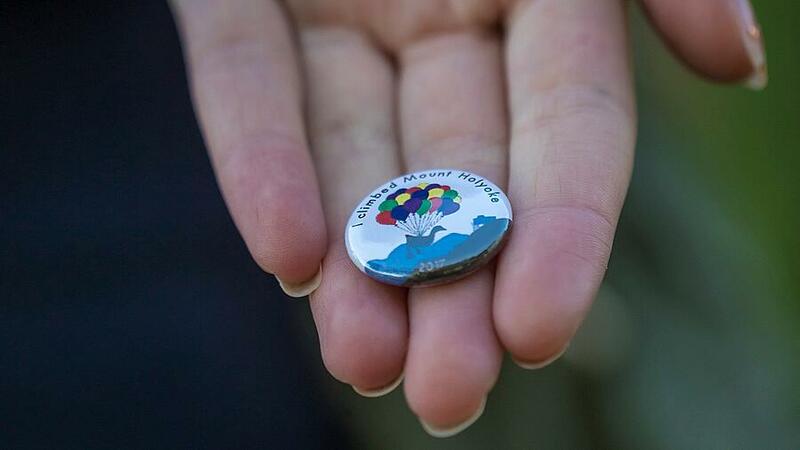 Button-making in honor of Mountain Day 2017 will be available in Archives for the rest of the week. “It’s a good day to be a Lyon!” breakout chants.